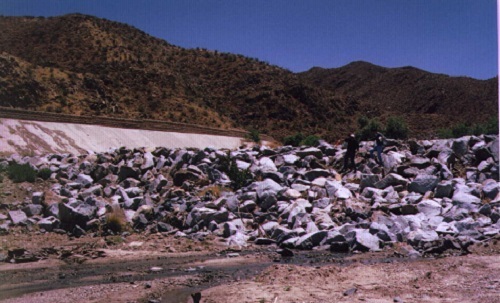 Palm Canyon Wash Streambed Stability Analysis (CA) | WEST Consultants, Inc.
Palm Canyon Wash is located in Palm Springs, California. Scour and stability problems on the wash were threatening the structural integrity of a drop structure upstream of the Bogert Trail Bridge. An incised channel had developed below the drop structure within the constructed watercourse, extending downstream of the bridge and threatening that structure as well. Riverside County Flood Control and Water Conservation District (the District) called on WEST Consultants to analyze the situation and propose a solution to the problem. Using hydraulic modeling and stable-channel slope analysis, WEST concluded that the stream was seeking a new equilibrium downstream of the drop structure, resulting in an incised channel within the wash. Once the incision reached the drop structure, the resulting loss in its energy-dissipating effectiveness served to exacerbate the problem. The stable channel slope analysis, corroborated by a comparison of recent survey data, indicated that the incised channel was approaching an equilibrium state, but further degradation was still possible. In order to stop the progression of the channel cut, WEST proposed to install a second grade control downstream of the Bogert Trail Bridge. Considering several designs, WEST determined that a sloping drop structure with a stilling basin and baffle blocks was the most appropriate, primarily because the flow at the drop was characterized by a low Froude number. WEST also made recommendations to increase the energy-dissipation effectiveness of the upstream drop structure.